One of boxing’s newest promotional companies Rivera Promotions Entertainment is co-owned and managed by AJ Rivera, who at twenty-four-years-old is one of boxing’s youngest promoters and his father, Jose Antonio Rivera (41-6-1, 24 KOs), a former three-time, two-division world champion. They formed their company in January of this year from their hometown of Worcester, Massachusetts. Rivera Promotions Entertainment has gotten off to a strong first-year. They held three boxing events (January 19th, April 1st, and June 10th) in two different venues (Worcester Palladium and DCU Center), and one of their bouts was for a regional title, when in their last outing, Irvin Gonzalez defeated Raul Lopez for the vacant Universal Boxing Federation East Regional Title. They will look to capitalize on their early success with their fourth and final fight of the year “New England’s Future 4” on Saturday, October 28th at the DCU Center in Worcester. This ten-card event features seven undefeated boxers and is headlined by cruiserweight Vinnie Carita (16-1-1, 15 KOs). Carita is unbeaten in his last thirteen bouts and has scored six consecutive knockouts. He will look to continue his winning streak against the hard-punching veteran Saul Farah (64-23-3, 56 KOs). Rivera Promotions Entertainment is not only happy with how things have gone this year, but they are equally proud that they brought boxing back to Worcester after being absent for the better part of the last decade. This city played an integral part in Jose’s boxing career. It hosted fifteen of his bouts (13-1-1, 11 KOs), including two world titles, the latter of which, he defeated Alejandro Garcia for the WBA super welterweight title in 2006. Despite Rivera Promotions Entertainment’s initial success, they have had to overcome a lot of obstacles that comes with the sport, like local promoters stealing fighters off their show by offering them more money to box on their card. They have had to constantly obtain last-minute replacements for fighters when their opponents either fail their medical tests or back out for whatever reason. Rivera Promotions Entertainment has also had to contend with the numerous fees, licenses, and other regulation deadlines that the Massachusetts State Athletic Commission imposes on them in order for their event to happen, which can be a daunting task for first-time promoters dealing with one of the more stringent athletic commissions in the country. Furthermore, they have to navigate a business that is extremely competitive, cut-throat, political, and heavily saturated, especially of late. Yet, none of that bothers AJ because he is used to overcoming odds since birth. He was born prematurely with Spina bifida which led to weakness and paralysis in his legs and delayed learning; however, he overcame the odds with a lot of hard work and perseverance and today, he is healthy. The easy going, hard-working, father/son duo has a great working relationship as they evenly divide their tasks. AJ handles the matchmaking, contracts, payroll, posters, and ring card girls, while Jose deals with the venue, insurance, and tickets. While AJ has been a boxing promoter for less than a year, he has gained a great deal of invaluable experience in this business from various facets. He has been involved in boxing since he was five-years-old, before he went to school or could spell his name. Since his father was a single-parent, he went to all of his dad’s training camps and bouts and attended all the behind-the-scene negotiations for fights. He also had a brief, but successful amateur career which spanned twenty bouts. 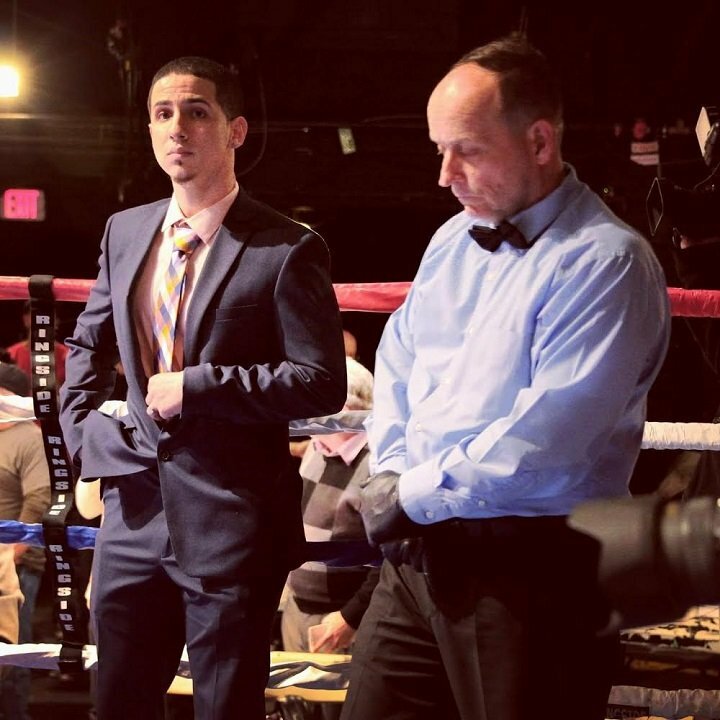 After he graduated from Johnson & Wales University with a degree in Sports Entertainment and Event Management in 2016, he worked for Jimmy Burchfield, Sr.’s Classic Entertainment & Sports for a year where he assisted with matchmaking and promoting fights. Over the years, his first-hand experience has shown him what worked and what did not for promoting boxers and he has incorporated that knowledge into Rivera Promotions Entertainment. Rivera Promotions Entertainment will promote a couple of boxing events in Connecticut next year, in addition to their four bouts in Worcester. They will also potentially sign fighters. In 2019, Rivera Promotions Entertainment will look to expand their operations to other New England states, showcase bouts in bigger arenas, and obtain television coverage for their fights. Amazingly enough, this promotional company almost did not happen because Jose tried everything he could to dissuade AJ from becoming a promoter. Jose did not want him to be part of a brutal, cruel, and unfair sport which he unfortunately experienced throughout his nineteen-year career. Jose also believed that promoting would be difficult to make money. He promoted a boxing card in 2008 with himself in the main event against Clarence Taylor (who he defeated via an eight-round unanimous decision), but lost six thousand dollars. For more information on Rivera Promotions Entertainment and the latest updates on their upcoming bouts, friend them on Facebook at RiveraPromotionsEntertainment and add them on Twitter @RiveraPromEnt, @joseriverachamp, and @KingRivera_.